What's in a domain name ? When a company takes an URL it's not necessarily to use it*. It can be a defensive move, for instance to limit noise around one of its brands. ... which doesn't change anything : the best way to protect a brand is to use it, and iSlate would make a nice brand to rival the "tablet" label (I can't see Apple marketing a "tablet device" any more than I can see it mention "PC" for its own devices). Anyway Apple needs to propose a solution for scribblers, sketchers, and their readers. Google has yet to join the netbook party, but I can't see Google NOT working on some android thing or another in that field, and not just to fill the fabled 20 percent time. ebooks, tablets, and related mobile devices are nothing new but they are bound to have a better decade than the one which is about to end. * I recently got rid of the bulk I owned after my registrar tripled the annual fees, and some have been snatched right away but that's OK.
Apple is expected to announce the entertainment gizmo (ebook, movies, music...) in an event on January 27th. Onse Telecom announced its intention to become a MVNO by 2011, lobbying the National Assembly to pass the law obliging 3 incumbents to open their networks. The landline operator boasted it could claim 5% of the market (about 2M customers), thanks to lower rates and "differentiating" offers. I guess Onse execs are more interested in "diversification" than "differenciation" : VoIP is bound to hit seriously their core business in Korea (international voice services - ie Shinbiro calling cards), and all 3 incumbents are also integrated fixed-mobile players, only bigger : LG Telecom is about to follow SK and KT and to merge all its telecom units. Differenciation through creative marketing ? Don't expect support from the new mother company : Taihan Electric Wire is into wires, fibers, powerlines... Onse itself delivers equipments and systems, even if it stopped its terminal manufacturing activity last year. So the message is not "Onse Telecom wants to be a MVNO" as much as "if you want to become a MVNO in Korea, Onse Telecom can help you face the big guys." Of course they could leverage on their customer base, but they also enjoy a certain technical know-how, and the experience of interfacing with different network operators. So they could position themselves as the ideal MVNE, starting with themselves as the first customer. mot-bile 2009 - French regulator ARCEP gave the final nod to Illiad's 100% (for the moment - see previous episodes including "Free: alea jacta est") subsidiary. Free Mobile gave all the guarantees needed and pledged to offer all web services on the mobile, including VoIP. Also to be noted : total transparency for the cost of mobiles. Consumers will know when they pay for the devices or for the traffic... greenfield Free found a smart way of disturbing the local operators / manufacturers cuisine. Overall, Free gets 382 points out of 500 : 55/65 for commercial offers, 64/100 for coverage, 20/25 for QoS, 54/60 for relationships with service providers, 22/25 for customer relationships, 22/25 for environment, 22/25 for employment, 56/75 for business plan consistency and credibility, 72/100 for project constistency and credibility.
. TTM / commercial launch : 2 years from now.
. customer services : customers can contact for free consumer associations when they want to post a complaint ! The best way to relieve Free's hotlines and to get rid of the said associations !!! Of course, Free Mobile's capital is as expected very likely to be raised to finance both 3G and FTTH, and that's been clearly specified in the proposal. Next steps for the ARCEP ? Attributing the remaining blocks of frequencies : 5 and 4.8MHz in the 2.1GHz band (H1 2010 - open to any player), and the 800 MHz and 2.6 GHz bands for 4G (H2 2010). mot-bile 2009 - TeliaSonera launched commercially 4G LTE in Stockholm (Ericsson network) and Oslo (Huawei network) with a Samsung 4G USB key. Roll out will continue over 2010 : the 4 biggest cities in Norway, the top 25 cities and vacation areas in Sweden. Of course, handsets are not ready yet, and the MNO makes good use of this technical and PR stunt to draw new partners : "Evaluation of suppliers for TeliaSonera's common 4G core network and radio networks in the Nordic and Baltic countries is in progress and vendors will be selected in the beginning of 2010*"... Too late to save the face of a well known Finnish vendor called Nokia. Sonera comes from Finland and TeliaSonera was awarded a license there last month, but the group is based in Sweden and proceeded with the Chinese champion along with Ericsson. Of course, TeliaSonera is likely to select buyers as well as vendors. And the likes of France Telecom could also feel the 4G acceleration. This operation has been smoothly run for months, without overhyping. TeliaSonera even launched ahead of schedule. No big deal. A non-event, almost. Far from the complex launch of 3G by NTT DoCoMo but then again, technical, commercial, and political challenges were completely different. And back then, NTT DoCoMo was claiming the world and calling smaller fishes to join his big pond. Here, TeliaSonera is clearly calling a bigger fish : hey Santa, please hire me in your workshop ! look, been a good elf, uh ? I showed you the goods, now show me the money. 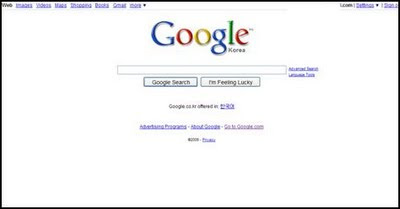 Google Phone At Hand. No Kindling. mot-bile 2009 - Nexus One is all over the web. Unlocked, open, bare, the gPhone will probably be cheaper than an iPhone... MNO subsidies not included. MNO subsidies ? As Big G eventually takes on Apple & co on their core business, it decides to redefine the whole handset ecosystem : direct sales, operator agnostic, Dell Computer style, without the intel inside jingle. Imagine a small M-VNO proposing competitive rates for data. All of a sudden, a bunch of nerds subscribe for their brand new Nexus and bring the house down. Far-fetched ? 3% of iPhone users generate 40% of the data traffic on AT&T's network, to the point the operator confessed : "we've got to get to those customers and have them recognize that they need to change their patterns or have to face other things" (see "AT&T may penalize iPhone users who hog data"). In other words : be a good customer, but not too smart. or else... "face other things". Whatever that means. Maybe some big guy with a slight Italian accent will come with a baseball bat and redesign your knee caps, or upload a creative application on your face. Nexus One makes a lot of people nervous. Some even consider lawsuits : if Google inaugurates itself the next version of Android, the newcomer may face charges of anticompetitive behavior, even if it only sells one device. I'm looking forward to an interesting 2010 year : Apple facing full-fledged competition, Nokia going at Blackberry's throat... and Google releasing its Kindle. Because that's basically the same story for Google and Amazon : beyond the device (the "Google outside", if you prefer), the aim is to understand the whole value chain and to secure future revenues in a field that's bound to represent a great chunk of the core business in a very near future. The main difference : Google are not into distribution, IRL. Who wants to marry a former billionaire with a new name (AOL Inc.), a new logo (Aol. nothing), a couple of valuable web brands, a few million ISP customers... ? Ring my bell, says Tim. And he'll be doing just that, himself, at the NYSE this Thursday morning. It does raise the image of the Salvation Army but precisely, something Dickensian could happen - you know, the down-and-out-then-back-on-top kind of tale... ? Time is money. Google used to prove it by skimming all fat tissues from its most essential URL, but now they're following the adage in a different meaning : let's not waste time catching up with leaders, even if it means bending sacrosanct rules. But if low carb homepages are history in Korea (and probably Japan and China, where Big G's market shares are also below "normal"), "don't be evil" is still standing. 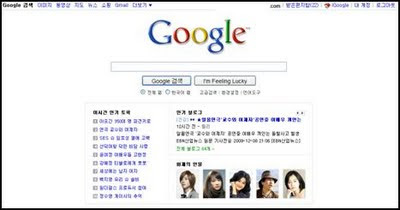 According to Joseon Ilbo, Rankey estimated that the new Google homepage, launched on Friday the 4th, gained 83% Saturday (reaching 921,000 visitors), plus 29% Sunday, plus 9% Monday. No comparisons were given with the previous week.